The Fellowship is a selective year-long program designed to accelerate the development of top student entrepreneurs across the United States. Fellows have priority access to all Future Founders services plus benefit from mentoring, entrepreneurship retreats, a peer community, and volunteer opportunities through other Future Founders programs. The 2019 Fellowship will take place from January to November 2019. The Fellowship is open to ALL young founders (18-30) who are a founder and equity holder of the company (typically the CEO or C-level position), and who are decision makers of the startup. School enrollment is not a factor in Fellowship eligibility. Ideal candidates should be proactively taking steps to grow their businesses. If you would like to be notified with applications open for the 2020 Fellowship, please click here. Furthermore, you’ll join the ranks of previous cohorts that have accomplished some incredible things. The data below reflects the success of the first three cohorts of the Future Founders Fellowship (as of February 2018). 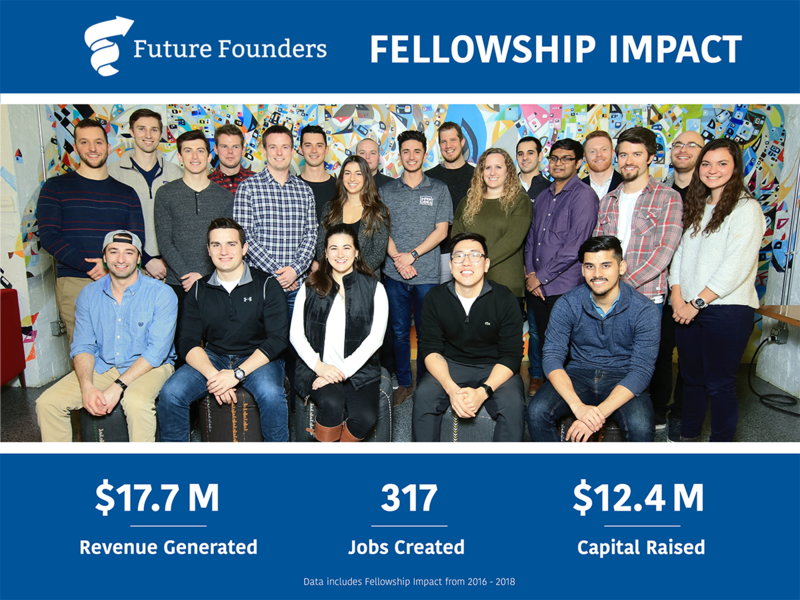 Read more about the impact created by Future Founders Fellowship alumni.